Another great operating event. I sure wish more would operate 160/80. Most stayed on 40 and 20 meters. Thanks to all that pulled my five-watt signal out well enough to make a contact. See you next year! My first 7QP. Nice contest. Used FT-847 about 100W plus 1-element delta loop 7M height. With eight hours of operating time, and putting up the antenna before the evening run... it was a fun time by all. One hunk of wire and a KD1JV Tribander rig, except for 15m....used a K2 for that. My first serious QRP CW effort! Highlights include a call from LY5A on 20 with a simple Marconi and two elevated radials and a couple of good runs on 80 with an End Fed Half Wave. Thanks to all for your patience as I had lots of requests for repeats, as expected when operating QRP during a popular contest such as this one! As usual, two family birthdays kept me busy most of the day, but I still managed to get a few hours in at the end, and come close to my previous best score from 2010. Thanks for all the Q's! Like last year this year I had a lot of fun with the 7QP Contest. I had a new arrival in this shack late last month I am having a lot of fun. I treated myself to a new FT-897D for my Birthday later this Spring. The DSP really helps. Surprised to work so many 7 area stations. Some all-time new counties for me. K3 died six hours into the contest. Took four-hour break while I dusted off my old K2 which had not been used in eight years. Never could find the computer interface cable, so sent the last seven hours by hand. We managed to work over half of the 7th call area counties in 18 hours...but W0BH is still the 'dog in the yard'. You smoked me again Bob. If it's any consolation, I had just gotten out of the hospital two days before! We got 4 new counties towards all US counties a second time. Could have been 5 but one rover just left a county and couldn't get it for me (one of my last two in the state!). One of the better QSO parties! VOACAP says 7QP states are too close to me for 15m and predicts a big donut hole extending out past the Rockies. Contrary to that I made contacts on 15m with OR, WA, ID, MT, WY, UT and AZ. NV is the only state I did not hear on 15. N7ZZ was my closest 15m at only 433 miles. Some contacts sounded like backscatter (light signal with a little echo) but others were loud, clear, and sounded like short path. On 15m I have a homebrew Moxon 2-el. at only 30 ft, pointed to my northeast. 4NEC2 shows a primary lobe at 18 deg. elev. and a secondary lobe at 70 deg.-- maybe the medium to high takeoff angle helped? In the afternoon the Moxon also acted the way VOACAP predicted it should and brought in strong INQP and NEQP signals. Heard no 7QP'ers on 10 meters, only a couple of ZLs and a few 4-landers doing 10-10. No digital contacts this year. Called CQ on 7080 kHz using RTTY but I had no takers. Great party again..strong sigs here in the early Sunday morning which reminded me on the old days in 2001-2003 when sigs from the West Coast came in in early mornings. Crazy condx with W7 on 15m in the middle of the night! Nice to catch all the rovers. Could only put in a little time since the NEQP was this weekend and I get confused running two different contests at the same time. Great activity in the contest wish I could multi-task better...maybe if I become a bit more proficient with the hobby I'll be able to do both contests in the same weekend. Steve K7KO and I were basically it for CW (Carl W7BRO operated for a short while...). We were called away periodically to solve technical problems and such, being as Steve was the antenna guy and I was the computer guy, so we must have missed two or three hours, but otherwise we kept things going on CW fairly well. All-in-all, it was a fantastic weekend. From all of the operators from N7J here in Columbia County, OR I want to thank the CODXC for another great 7QP this year! You can see that a great time was had by all, and we look forward to next year. Great fun. Full write-up and photos here. 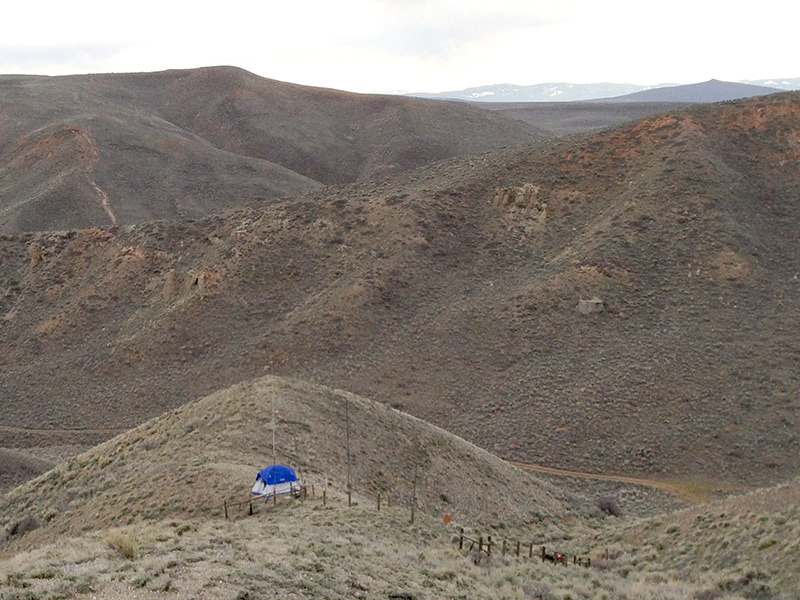 I operated seven hours SSB only from the Idaho, Wyoming, Utah Three Corners intersection (IDBEA/WYLIN/UTRIC). 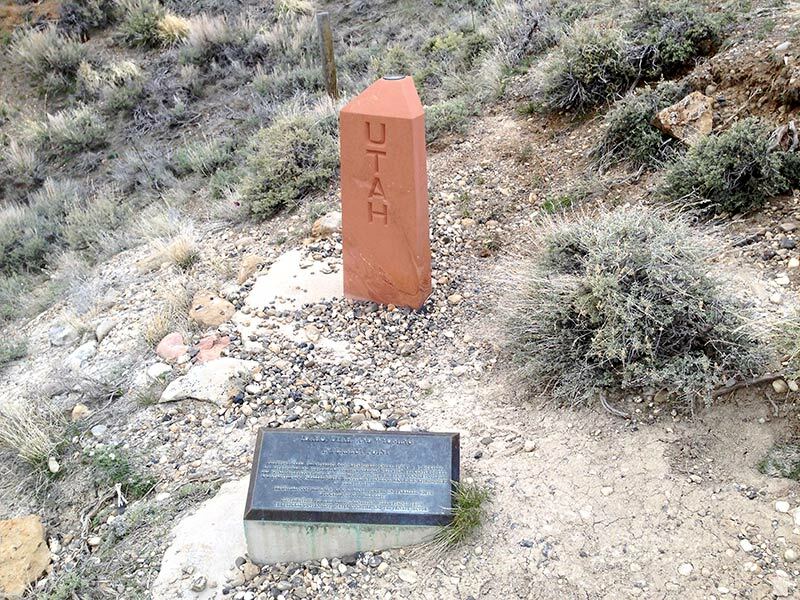 It's a very remote location that required a four wheel drive, ATV, and a lot of leg work to get to. I had to end early due to extremely strong winds and threat of rain, but had a lot of fun despite few multipliers. Loved hearing so many "7's" on the air. This is my first 7-area QSO party I've entered. Will definitely do it again. Nice conditions this year -- especially on 40m and 80m, which were quiet and unusually strong from my QTH. Would like to have had some activity on 10m, and a bit more on 15m, but I can't complain because the other bands made up for it. Great to hear all the familiar calls. And thanks to the mobiles who kept providing more QSOs every time I was about to lose heart. The N7XU guys were especially helpful -- they found me 10 times as they wound their way through ID and OR. Operated the 2013 7QP from the Lane/Linn County line where Marcola Road turns into Brush Creek Road, the same QTH that I have used for four consecutive years. This year I erected a 40/20 meter EDZ between two trees which were over 200 feet apart on a north/south line. Although I could not get the antenna much more than 30 feet above the ground at the feedpoint, I did notice that the poor little '706 wanted to overload on 20 CW in the afternoon with some of those BIG signals from the east. I even switched in the attenuator to keep the receiver from "crunching" too much! It definitely beat the inverted vees that I had used in past years. Murphy played havoc with my little 900 watt generator, which would run smoothly only up to about 100 volts output. Even so, the Astron RS-35 supply struggled along admirably. I did not have to run over 50 watts to stay in the fray. 15m was poor and 10m was almost dead, but 20m was hopping. Did PSK31 exclusively and had enough activity to keep from getting bored (73 Q's, including a few dupes). Amazing the number of S9+ signals on PSK31 that could not hear me....but I was able to work S. Africa and Indonesia with 35 watts. My wife and I traveled to UT for a relaxing day and the 7QP. She was awesome in helping me erect a couple of 35' masts and a multi-band dipole for the QSO Party. Murphy arrived early so I missed the first 35 minutes, but managed to do fairly well for a low power, expedition entry. This was good practice for the ARRL Field Day. The biggest surprise was making barely under 50% of my points on CW! Being a diehard SSB operator, thanks to all who patiently waited for me to get their calls in the log. We'll be back next year if my work schedule permits. I hope some of you will join me in the New Mexico QSO party the second Saturday of April. 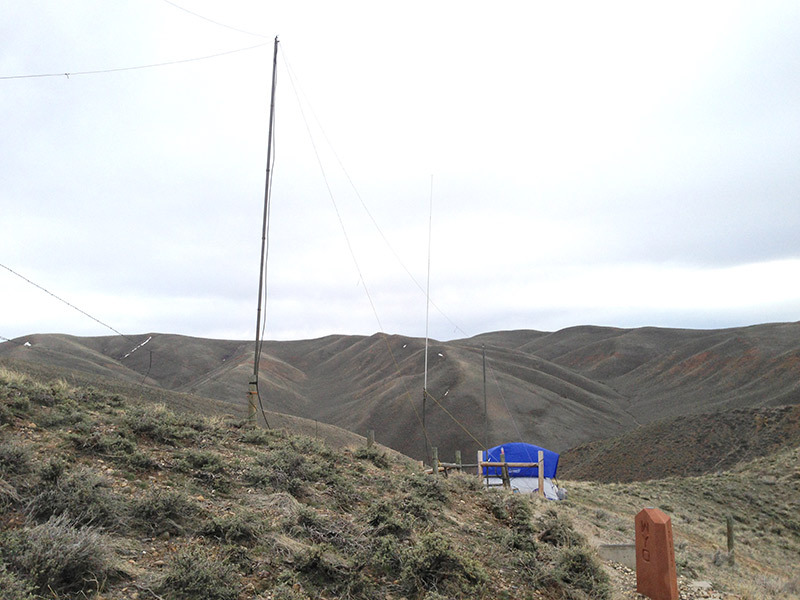 May of 2013 again found the TERAC crew operating K7AUO from the abandoned Air Force Radar base on the plateau above Condon in Gilliam County, Oregon. It was a blast to hear folks say, "first time ever for Gilliam County." Especially fun to hear it from the DX stations. We hope to do some more of that next year. Unlike the last two years, we had no rain, but It was a bit breezier than we would have preferred. 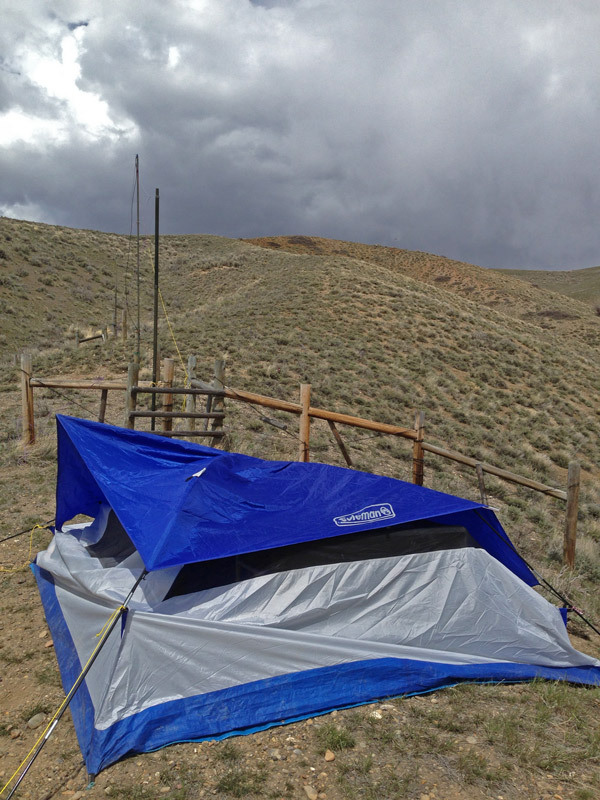 Our trailer-mounted tower with beam and inverted-V, as well as our 43' 40m vertical, survived 37 mph gusts! Great conditions. Wish I had a 7 call. A really fun contest as always !! Finally was able to get on 75M phone after redesigning the remote antenna tuner for the 54-foot vertical. Seems that the next step in improving the station would be to get a 2nd K3 for SO2R, but probably would be more worthwhile to invest the time in adding 80M/75M elements to the low frequency circle array. Meanwhile, will probably remain SO1R for the forseable future.